Dividend investing is part art, part science. Financial ratios make up most of the science behind investing. What exactly are financial ratios? For the purposes of this article, we define financial ratios as any number or calculation used by dividend investors to better understand an investment opportunity. Financial ratios are found throughout a company’s financial statements, annual reports, investor presentations, and more. Some examples of common financial metrics include return on equity, payout ratios, and price-to-earnings multiples. While there are literally hundreds (if not thousands) of different financial ratios, understanding a handful of the most important indicators can help investors make better informed decisions and sidestep avoidable mistakes. Let’s take a close look at the financial ratios that are most helpful for evaluating different businesses. The dividend payout ratio is perhaps the most common financial ratio known by dividend investors. The dividend payout ratio measures how much of a company’s earnings are paid out as a dividend. To calculate a company’s dividend payout ratio, simply divide the amount of dividends it paid over a certain time period by the amount of earnings it generated. 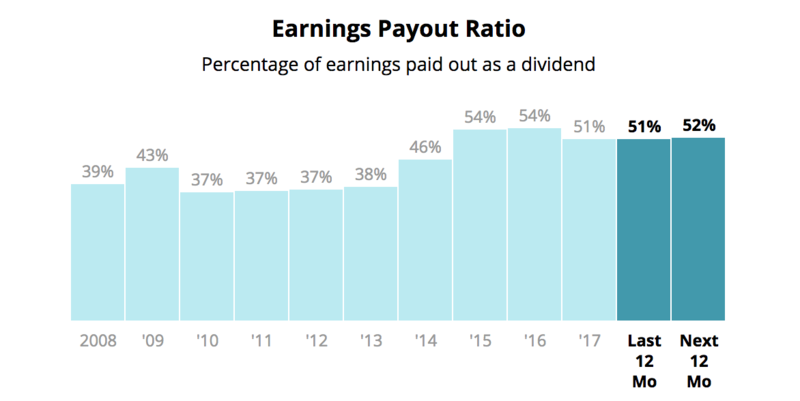 For example, if Coca-Cola has a payout ratio of 60% over the last year, the company might have paid $6 per share in dividends while generating $10 per share in earnings ($6 / $10 = 60%). Investors like to analyze the dividend payout ratio because it can inform how safe a company’s dividend is and how much room it has for future growth. A high payout ratio (e.g. above 70%) could mean that the dividend payment is riskier because it consumes the majority of a company’s earnings. If business trends unexpectedly fall, there might not be enough profits to keep paying the dividend. Dividend growth can also be more difficult for companies with high dividend payout ratios unless earnings growth is strong. Generally speaking, we prefer to invest in companies with payout ratios below 60%. However, we will invest in companies with higher payout ratios if their businesses tend to be very stable (e.g. a regulated utility business) and they maintain strong financial health. 3M Company’s (MMM) dividend payout ratio below is an example of what we really like to see. Note how stable its payout ratio has been. Perhaps even more impressively, 3M has increased its dividend by nearly 10% per year over this period. The company’s relatively flat payout ratio means that its dividend growth has been sustainably fueled by growth in its earnings. Without free cash flow, a company is unlikely to survive over the long run. Free cash flow is calculated using the company’s statement of cash flows. A company’s capital expenditures (i.e. money spent on property, plant, and equipment) is subtracted from its cash flow from operations (i.e. net income adjusted for non-cash charges such as depreciation) to arrive at free cash flow. If a company does not generate free cash flow, it does not have funds to return to shareholders via dividends and share repurchases, nor does it have sustainable cash flow to use for acquisitions or debt repayments. Companies that fail to generate free cash flow typically have capital-intensive businesses with few competitive advantages. We prefer to invest in companies that consistently generate free cash flow in virtually every environment. Paychex (PAYX) is one such business. The company provides a variety of payroll processing and outsourcing services to small and medium-sized businesses. Its operations require little capital and enjoy high recurring revenue, resulting in extremely consistent free cash flow generation. On the other end of the spectrum, United States Steel Corp (X) has been an unpredictable free cash flow generator. The company must invest heavily in its capital-intensive steel mills and has little control over the prices it can charge for its products. Looking at free cash flow generation alone, Paychex appears to be the more reliable dividend payer of the two companies. Suppose you had $100 to invest. One company can turn your $100 into $105, but another company can produce $110 with your money. All other things equal, we would pick the second company because it can grow our money faster. To keep things simple, that is what return on invested capital is all about. Businesses take in funds (debt and/or equity) and invest to generate a return for shareholders. Companies that earn higher returns can compound our capital faster and are generally more desirable. Companies that earn returns below what investors demand should, in theory, eventually go out of existence. For these reasons, one of Warren Buffett’s favorite financial ratios is return on equity, which divides a company’s net income by its shareholders’ equity. For example, if shareholders purchased $100 of stock to fund a company and it generated $10 of profit, the company’s return on equity would be 10% ($10 of net income divided by $100 of equity). Buffett likes companies that earn a high return on equity because they compound earnings faster and usually have some sort of competitive advantage. Return on invested capital is similar to return on equity, but it measures a company’s return on equity and debt. This is a key adjustment because it helps adjust for differences in capital structures between firms so we can better compare them. For example, suppose there were two companies that each had $100 worth of assets. Company ABC financed its assets all with equity ($100). Company XYZ financed its assets with $20 of equity and $80 of debt. Both companies generated $10 per share in earnings last year. If we were simply looking at return on equity, Company ABC would have a return of 10% ($10 of earnings divided by $100 of equity). However, Company XYZ would have a return on equity of 50% ($10 of earnings divided by $20 of equity). At first glance, Company XYZ would seem like the superior business despite their identical level of assets and earnings. Using return on invested capital instead, we would find that both companies generated a 10% return ($10 of earnings divided by $100 of total capital). When we analyze a company’s return on invested capital, we look at the level (e.g. 10%) and consistency of its returns (e.g. does it earn a stable return each year or are the returns very volatile). A stable, double-digit return on invested capital over many years of time is often the sign of a highly profitable, efficient company that could have an economic moat. One example would be Coca-Cola (KO), one of Warren Buffett’s largest holdings. The company has earned a return on invested capital between 13% and 28% in each of the last 10 years. A company’s operating profit margin divides its operating profits by its total sales. Operating profits generally represent the company’s earnings before interest and taxes. By excluding these expenses, we can compare companies regardless of their financing choices (debt results in interest expenses) and tax treatments to focus on the profitability of their actual operations. Higher operating profit margins can be a sign that a company has an economic moat. Just like with our analysis of a company’s return on invested capital, we pay close attention to the level and consistency of a company’s operating margin. High and stable margins are preferable because they help earnings compound faster. Asset turnover is a less familiar financial ratio but an important one as it relates to efficiency. To calculate a company’s asset turnover, we divide its total sales by its total assets. The metric tells us how many dollars of sales each dollar of assets generated. Companies that generate more sales from their assets can squeeze out more profits. Even if a company has low margins, it can still generate a good return on invested capital for shareholders if its asset turnover is high. Walmart (WMT) is a good example. The company’s operating profit margin has hovered near 5% in recent years, which is relatively low, yet the business was still able to generate a double-digit return on invested capital because its asset turnover was so high (Walmart sells a lot of products every day). Companies that can more efficiently use their assets can improve their asset turnover and return on invested capital. Sales growth is a basic financial metric that simply subtracts one period’s revenue from another period’s revenue and expresses the difference as a percentage of the former. For example, if sales increased from $100 last year to $120 this year, sales growth would be 20% ([$120 – $100] / $100). Why is sales growth so important for investing? While profits still matter the most, trends in sales growth can inform us about the volatility of a company’s business model and its ability to continue expanding. Let’s take a look at Nucor (NUE) as an example. Nucor is a member of the dividend aristocrats list and manufactures a wide variety of steel products. As seen below, the company’s sales plunged by 53% in 2009 and have been highly volatile most years. There is little in Nucor’s control when it comes to growing its business because it is very sensitive to the economy and the price of steel. If an investor is considering buying a company with cyclical growth trends, they need to be sure they are not picking it up near peak demand – buying a cyclical at the top of a cycle is one of the easiest ways to lose a lot of money quickly. On the other hand, Becton Dickinson (BDX) has consistently churned out relatively stable revenue growth – even throughout the last recession. The healthcare company sells a number of essential medical devices and systems that are needed in practically every economic environment. All else equal, we prefer to hold businesses that sell products and services with more stable demand. These companies often have more within their control and produce steadier earnings growth. Financial leverage can be very dangerous. Those of us who have felt the pains of credit card debt or an excessive home mortgage understand that borrowed money can be a very dangerous thing if we overextend ourselves. That’s also true for businesses and is a main reason why we look at a company’s net debt-to-capital ratio. This financial metric tells us how much debt (net of cash on hand) a company is using to run its business. If a company has $100 worth of equipment, it acquired that equipment through some combination of debt and equity. The net debt-to-capital ratio tells you what proportion of a company’s financing is from debt. Using the example above, suppose the $100 of equipment was supported by $20 of debt and $80 of equity. The company’s debt-to-capital ratio would be calculated as follows: total book debt ($20) divided by total book debt ($20) plus equity ($80). The result is a debt-to-capital ratio of 20% ($20 / $100). In other words, debt accounts for 20% of the company’s capital structure in this case. We prefer to invest in companies with a net debt-to-capital ratio no higher than 50%, although some businesses such as utilities can reasonably take on higher debt levels due to the reliability of their earnings. If a company unexpectedly falls on hard times and has too much debt and interest to pay with its dwindling cash flow, its stock price can get crushed and the dividend payment becomes that much riskier. Companies will always pay their debt obligations before paying a dividend. While the debt-to-capital ratio was focused on the company’s capital structure, the net debt / EBITDA ratio compares a company’s debt to its earnings. The idea behind this financial ratio is that a company with a seemingly high level of debt might not be as risky as it appears if it is generating a lot of profits and has plenty of cash on hand. Net debt is a company’s total debt less the cash it has on hand. For example, if a company had $100 of debt and $10 of cash, its net debt would be $90. EBITDA stands for “earnings before interest, taxes, depreciation, and amortization” and is meant to be a proxy for cash flow, although it does not account for a company's capital expenditures to maintain and expand its business. Despite this shortfall, EBITDA is a helpful metric for comparing different businesses. EBITDA is typically measured over the course of one year. Dividing net debt by EBITDA, we can calculate how many years it would take a business to pay off its debt using its cash on hand and annual cash flow. Suppose Pepsi had $100 of debt, $10 of cash on hand, and $45 of EBITDA last year. Pepsi’s net debt would be $90 ($100 of debt less $10 of cash). Dividing net debt ($90) by Pepsi’s EBITDA ($45) gives us a net debt / EBITDA ratio of 2.0. In other words, Pepsi could theoretically eliminate its debt with cash on hand and two years’ worth of cash flow. We generally prefer to invest in companies with a net debt / EBITDA ratio no greater than about 3.0, but companies with more stable earnings can afford somewhat higher leverage ratios. The price-to-earnings (P/E) ratio is arguably the most popular valuation metric used by investors. The metric simply divides a company’s stock price by the amount of earnings per share it has generated over a one-year period. Historically speaking, the long run average P/E multiple for the market has been about 15. Companies perceived to have more stable earnings and faster earnings growth potential usually trade at higher earnings multiples than the market. We generally prefer to buy companies that trade at P/E ratios less than 20 and intend to hold our stocks as long as possible once we buy. As dividend investors, there is a constant temptation to focus on yield alone. After all, the dividends a company is scheduled to pay are a very tangible return. However, we are still total return investors – a 6% dividend yield does an investor little good if the stock price falls by 40% over the course of his holding period. Total shareholder return (TSR) measures the increase in a stock’s price, including any dividends paid. For example, suppose shares of Coca-Cola were trading at $50 at the beginning of the year. If Coke’s shares increased to $58 per share at the end of the year and the company paid dividends of $2 per share during the year, the stock’s TSR would be 20% [($58 per share stock price + $2 per share in dividends) / ($50 per share starting stock price) – 1 = 20%]. Well-managed businesses should create shareholder value over time by delivering a return at least in line with the broader market. We will look at Johnson & Johnson (JNJ) as an example. The table below shows J&J's total shareholder return (TSR) per year over three different time periods. The company’s TSR is then compared to the market’s to see how the stock performed. As you can see, Johnson & Johnson meaningfully outperformed the market in each period, creating massive value for its shareholders. An investor who bought shares of Johnson & Johnson at the beginning of 2008 would have outperformed the market by 2.6% annually since then. Of course, few stocks have been home run investments like Johnson & Johnson. The TSR information below is for United States Steel Corp (X). Simply put, the company has been an absolute disaster for shareholders, returning -10.8% per year from 2008-2017 while the market gained 8.4% per year. When a company has persistently destroyed shareholder value, investors really need to ask themselves why this trend would reverse any time soon. There is quite possibly something structurally wrong with the company’s business model or industry. At the end of the day, financial ratio analysis is only worthwhile if it produces actionable insights. In regards to dividend investing, we are primarily focused on using financial ratios to identify high quality stocks that pay safe, growing dividends. To help with that effort, we created a Dividend Safety Score system, which analyzes a blend of the most important financial ratios to rate the safety of a company’s dividend. We look at a company’s payout ratios, debt levels, free cash flow generation, recession performance, near-term business trends, and more to generate our scores. While investors should never take short cuts or blindly follow any quantitative system (as Charlie Munger would say, investing is not supposed to be easy), we like to use our Dividend Safety Scores to efficiently find high quality dividend stocks and avoid riskier sources of income. You can learn more about Dividend Safety Scores, view their track record, and learn how to apply them to your portfolio here. Having at least a basic understanding of the most important financial ratios for dividend investing is prudent. While investing involves plenty of unknowns and a large degree of randomness at times, there are numerous avoidable mistakes that investors can sidestep when armed with an understanding of some financial ratios.